Each year, fashion week comes and goes, with little distinction from past years. Streaks of bright lights fill the runway, as the world looks towards top designers in an attempt to define their own fashion sense. However, this year as the US presidential election heats up, political banter has made it onto the runway, catching the attention of both the fashion world and the real world. Notable designers such as Sonia Rykiel, Versace, Stella McCartney and Jean Charles de Castelbajac are making waves both on the runway and also in the political world. Putting their designs where their mouth is, European designers are not afraid to express their support for their favourite candidate. Meanwhile, Jean Charles de Castelbajac’s models are gracing the runway with Obama inspired garments. The Andy Warhol-like designer has placed an image of Barack Obama on the front of a dress, with the back featuring the words “I have a dream today”. Prior to the start of this year’s election, fashion has long contributed to societal commentary. 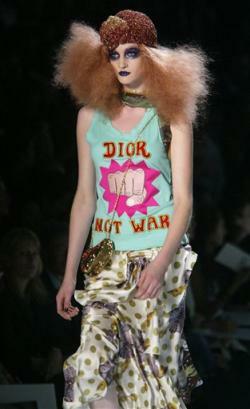 In the year 2005, Dior launched a “Dior not war” and “Dior for peace” campaign, sending models down the runway with John Lennon’s song “Imagine” playing in the background. Additionally, music icons such as P-diddy have created affordable clothing lines with the Vote or Die slogan. Marie Claire has teamed up with Armani Exchange to create a political t-shirt saying “Think fashion makes a statement… Try Voting.” Although in the end it is up to the voter to decide, these bold and moving iconic statements are ingenious in creating buzz. Carrian Jones- A girl with a question?